Detoxification is the method in which toxins are removed from the body. The human body has a natural detoxification system with the kidneys and liver. However, whenever undergoing Lyme treatment, Candida treatment, or your toxin load is too high, you may need to help your body with this process. While undergoing treatment, you will experience the Herxheimer Reaction. This is due to the body’s response to toxins. By drinking plenty of water and using detox methods, you can reduce the severity of this reaction and your symptoms while helping your body to heal. It is important to assist your body in removing the neurotoxins that are a result of the Lyme spirochete die-off. If the toxins are allowed to build up in the body it can cause permanent damage to the nervous system, brain, and organs. Dangerously high toxin levels can cause organ failure and death. I would also recommend being tested for the MTHFR gene mutations, as this can significantly inhibit yoru ability to detox and alternate treatment and diet may be required. For more information, see the Testing and Integrative Treatments pages. One of the best detox methods I have found is simply drinking a little bit of fresh lemon in water. The essential oil in lemon rind is antiviral, antibacterial, and induces liver detoxification enzymes. It is important to use a fresh lemon, preferably organic (since pesticides stay in the skin). It is the rind or skin, not the juice that has the benefits. Cut a small piece off, and squeeze so the oils are released from the skin. You can also buy Lemon Essential Oil, but be sure it is pure, genuine, and organic. You don’t need much as it is highly concentrated (see Essential Oils page for more information). I find a plain ole lemon does wonders. And, if you’re like me, it adds a little flavor to that dreaded boring water! You can also alternate with Peppermint, which also stimulates the liver. Fresh peppermint in water is very refreshing and a nice change of pace. Just crumple the leaves a little bit to release the oils. You could always do both, too. Cucumber is another wonderful alternative. Just put some slices in water, and voila, added minerals as well! Some people recommend using Alka Seltzer Gold when herxing is really bad. I’m not sure how it works, but it seems to help take the edge off. The salts help draw out toxins through your skin, and it helps give your liver and kidneys a rest so they don’t have to bear the full load. The Lavender is antimicrobial, antibacterial, antiviral, heals wounds and skin irritations, reduces stress and depression, and helps with sleep. You can also add some Organic Lemon Essential Oil to help stimulate detoxification. Or add Ginger to your bath as well! Light some candles, put on some soothing music, and give yourself a rest! Twenty minutes is generally a good amount of time. Do what you are comfortable with. Some Lyme patients cannot handle heat, so this would not be a good option for them. Check with your doctor if you have underlying conditions that may prevent you from taking a bath. If you are unable to take a bath because you have a port (for IV antibiotics), take a foot bath instead. Or even if you just like footbaths! You can use the same recipes, just use less and fill a large pot or bowl with warm/hot water. For feet you can even add in a small amount of Peppermint and Rosemary Essential Oils (just a few drops) and it will “cool” your feet. You could also go all out and get a foot spa. I’m not sure if you could use essential oils in it, but you could probably use salt. And this massages your feet, which hits pressure points for your whole body, releasing stress and helping to detox. Now I want one! Lemon Ginger Tea is another way to make you sweat out toxins without a hot bath. Just peel a chunk of fresh ginger. Slice it both directions, but not quite all the way through (so it stays together). Simmer in 4 cups of water for 15-20 minutes, until the water is golden colored and there is a strong smell of ginger. 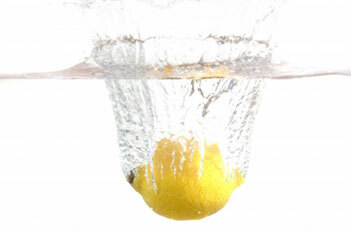 Squeeze lemon juice in cup, add sugar Substitute, and pour in Ginger Tea. Enjoy! Ginger is also a good tonic for digestive problems and nausea. The lemon helps stimulate the liver. Make sure you replenish water and electrolytes. And be prepared to sweat! Dry skin brushing has been used for centuries to improve circulation, stimulate detoxification and lymphatic movement. Our skin is our largest organ and is crucial in the detoxification process. It is done with a soft, dry brush, with natural bristles. You begin at yoru feet, brushing towards your heart, moving up your legs, your back and stomach, and then your arms. For more information, see the links to the right. In some cases, you may need additional lymphatic support. There is a delicate balance with this because you want to stimulate the movement of the lymphatic system, but you do not want to release large amounts of toxins into your body either. I have personally used Bay Laurel Essential Oil and put it on the skin along lymph nodes to stimulate the lymphatic system. However, this should be used sparingly and is not for long term use (see the Essential Oils page for more Info). Yoga, particularly Bikram Yoga, is a great way to stimulate the lymphatic system and overall detoxification. See the Exercise page for more information on Yoga and its benefits. Lymphatic support is very individual, and dependent on current toxin loads. I would recommend first discussing it with your doctor before trying any lymphatic massage or lymphatic support. Many people have had great success using IR Saunas for detox. I have not personally used one, but I have heard great things. And from the research I’ve found there are no unusual risks. If you like heat, and heat makes you feel better, this might be a good option for you, especially if you are having problems with detox. The idea is that they heat the tissues and induce healing and detoxification through sweat. It’s similar to feeling the sun, but without the dangerous UV. It is also a great way to relax (you can meditate while you’re in there!). Be careful not to overheat or become dehydrated. Replenish electrolytes and water. It is important to discuss this with your doctor prior to using it, because there are some risks and dangers. Some health conditions, such as high blood pressure, cardiovascular disease, adrenal issues, or problems sweating do not allow for Sauna use. DO NOT attempt without first discussing it with your doctor. If you do decide to go this route, do thorough research on the manufacturer prior to buying one. Not all manufacturers are the same. From what I understand, it is the FAR Infrared Sauna that is effective. NOTE: IR Saunas can help alleviate symptoms from the Herxheimer reaction due to its detoxification qualities. It can also help stimulate the immune system by mimicking a fever. However, it DOES NOT kill Lyme spirochetes. This is not to be used as a cure or treatment for Lyme disease. Caution: IR Saunas do have the potential to release toxins that are stored in fat and tissues, similar to herbal detox methods and fasting. If symptoms worsen, discontinue use and discuss it with your doctor. They do emit electromagnetic energy, so overuse or prolonged use should be avoided. Be sure you are eating a whole foods diet and are not putting any additional toxins into your body (see the Nutrition pages). Discuss any needed supplements with your doctor. Keep drinking water! Heavy metal toxicity is common in Lyme patients for various reasons. The most common tends to be from the use of long term antibiotics, poor water quality, and environmental exposure. This is something that should be tested for prior to beginning treatment, and should be dealt with immediately by your doctor. See the Heavy Metals & Parasites page for more information. If you are dealing with heavy metals, you may need to temporarily use charcoal chelation methods. Be careful with this, though, because it removes all nutrients, and all medications from your system. Timing is crucial with it, and it should NOT be used long term. Discuss this with your doctor before taking it. I would not recommend using any herbal detox pills or tinctures without first discussing it with your doctor. Some of these tend to release more toxins into your system that have been stored in your organs, muscles, and fat. This will only worsen the effects and make you feel worse. Turmeric is one trusted one that is also good for inflammation. Discuss it with your doctor prior to trying any of these. If all of this does not reduce symptom severity, you may need to discuss with your doctor reducing your medication or changing it temporarily as the toxin load may be too high. You should also rule out any possible allergic reactions. It is important to monitor this with your doctor because of possible allergic reactions. Dangerously high amounts of toxins in the body can also cause permanent damage. Don’t ignore detox. Smoking increases the toxic load exponentially, making it harder for your immune system to fight Lyme disease, and making it harder for your body to heal. I know for you smokers that you don’t want to hear it and you’ve got every excuse under the sun as to why you can’t quit. Let me tell you, as someone who used to smoke 2 packs a day and LOVED it, I’ve heard them all. And if I can quit…..anyone can quit. I’m not going to lecture you here; I know you’ve heard it all already and it’s annoying. You have to be the one to choose to quit on your own. Forget all the lung cancer ads for now. Just know that you are prolonging your suffering and severely compromising your healing by continuing to smoke as it destroys your immune system. Plus, you are supporting those corporations who seek to profit on the ill.
It’s a personal choice. In some cases, the detox from quitting can be too much, and you may need to wait to quit. Discuss it with your doctor and decide what is best for you. If you want tips on how to quit, send me an email, and I can give you some great ideas. Like I said, if I can quit cold turkey, without any meds, a patch, or any of that, then anyone can. I hope this helps you feel better! I know you’re strong enough to handle it! Detox allows your body to heal.